Mc MURDO BASE – ANTARCTICA – W.A.P. The Chapel of the Snows and its history – Part 1- . Antarctica’s first church in this site, was built in 1956 by volunteers using surplus materials. This building was destroyed by fire in 1978. The only things rescued were the chapel bell, two stained glass windows, and various small religious items. In 1979 a Quonset hut was remodelled to serve as chapel, and the building was dedicated in December. By 1982 another Chapel of the Snows had been built close to the original site (again with volunteer labour using salvaged material). preparation for Antarctic research to be conducted during the International Geophysical Year (1957-1958), U.S. Naval Construction Battalion personnel (Seabees) began building McMurdo Station during the 1955-1956 austral summer. 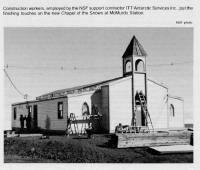 The Chaplain, Father John C. Condit, and volunteers from the construction battalion gradually gathered enough materials to build what was to become the first Church ever erected in Antarctica. All of the work was done by volunteers after their daily duties were finished. men, after a hard day’s work, would drift over to the church site. only at McMurdo Station but also from nearby Scott Base. Chapel of the Snows destroyed). out. The fire began in the rear heater room of the building about 5 a.m.
structure, the flames covered the entire chapel. chapel and pushed the rubble away from the cables and Building 108.
winter crews, were a total loss.